3.1) "The BBC exists to serve the public interest." - CANNOT BE DONE WITHOUT IMPARTIALITY. 4b) "The public purposes of the BBC are...promoting education and learning;"
- WITHOUT IMPARTIALITY "EDUCATION" BECOMES BRAINWASHING. 4e) "The public purposes of the BBC are...bringing the UK to the world and the world to the UK;"
- SHOWING A UNILATERAL VIEW ON ANY ISSUE IS HARDLY "BRINGING THE WORLD TO THE UK" OR VICE-VERSA. ALL VIEWS MUST BE PORTRAYED TO TRULLY ACHIEVE THIS PURPOSE. 6.1) "The BBC shall be independent in all matters concerning the content of its output, the times and manner in which this is supplied, and in the management of its affairs." 23) "In exercising all its functions, the Trust must act in the public interest and, in particular,it must—(a)represent the interests of licence fee payers;(b)secure that the independence of the BBC is maintained..."
VERDICT: THE BBC HAVE FAILED. It is also interesting to note that a very popular TV progam in the USA called The Mentalist only two weeks ago had a very extensive piece on assisted suicide. These ideas are regularly being planted into TV shows as being acceptable and almost routine. It is very sad when a person with an illness suffers but it is only one small step from informed consent to the State taking over the function. I am disappointed in Terry Pratchett. I have bought his books since 1982 but no longer. He has a right to his opinions but not when he uses the vast resources of the BBC in order to do it. Wouldn't time and resources be better spent finding a cure for cancer and Alzheimer's and finding good and natural sources of pain relief instead of encouraging people to take their own lives in an effort to avoid suffering? It is chilling to find that we have unprincipled people in places like the BBC who use goverment resources and media to further personal opinions and help sell books writtne by them.When people deny God they then decide to play god and decide who should and should not live.Let us boycott the books by people like that and protest,write ,flood the BBC with letters to let them know what ordinary human beings believe and think. "In each case, the power of the personal narrative is presented skillfully to shape public opinion, courtesy of the BBC with all of its publicly funded resources being brought to bear." This is such an important point, Peter. STORY (like drama) is incredibly powerful in moving and shaping people's reactions, and although I'm sure the BBC would argue that they always give space for 'comment' from contrary viewpoints that is NOT balance. Listeners/viewers identify with story. They argue or agree with debate. I'm wondering whether the BBC have ever asked you to suggest individuals who might be subjects for 'In-spite-of-everything-I-chose-to-live' stories. I'm sure you know some, like Katherine Araniello, Matt Hampson and Alison Davis. Your arguments are stupid here. The Julie Walters drama was not a pro-euthanasia show, it was a dramatisation of something that actually happened. Did you come away from watching it and suddenly believe in people's right to die? No. This is an issue people are interested in and the BBC are going to make programmes about it. If you can't tell the difference between propaganda and a television show that retold a sad story in all its gruesome detail, why not just switch off the TV? 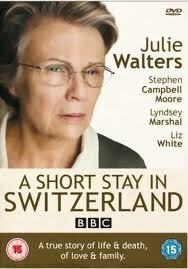 The Julie Walters drama involved a considerable amount of artistic licence and Anne Turner (whose life and death it depicted) was accompanied by a BBC news crew to Zurich the very day after the Voluntary Euthanasia Society rebranded itself as Dignity in Dying. This was no coincidence. It was all very carefully stage-managed. Have a read of the WHO guidance linked above and you will see that the programme breached virtually all its recommendations with respect to suicide portrayal on the media. Some television shows are actually thinly dressed up propaganda and this was a prime example. Turner's children, Edward Turner and Sophie Pandit, are now lead spokespeople for DID and the convictions of Fergus Walsh, BBC health correspondent who actually played himself in the show, have never been secret. This is really hard because all these things are happening because people fee now so depressed because of the speed in what we living, that's th reason there are many teenagers who want to kill themselves. 7m.cnld recommend, for starters, the following review articles freely available on the internet. Would you imagination only repost this kind of to the site our web site? One of the better to ensure credit is provided wherever it can be owing. Have a good a person! your post. They're incredibly persuading and might definitely do the job. However, your posts are quite small for newbies. May people you should increase these a lttle bit coming from up coming time frame? Just posting. We're simply talking about choices here. Those of you who are against assisted suicide, fine, that's your choice. But don't take away the choice from those who would like to choose a more humane way to end their suffering. It’s like you read my mind! You seem to know so much about this, like you wrote the book in it or something. I think that you could do with some picas to drive the message home a bit, but other than that, this is great blog. A great read.